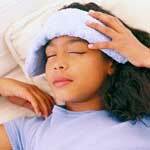 Migraines In Children - What Are The Preventive Measures? When our children hurt, all we want to do is to make them feel better. In the case of a painful chronic condition, that may be easier said than done. Migraines in children can be mostly harmless, or stem from a more serious underlying problem. While migraines in adults are more easily managed and require minimal professional care, migraines in children need to be evaluated to rule out more serious problems and complication via testing and imaging. If determined that a serious health concern is not the cause of your child’s migraine symptoms, not only will you be looking for fast relief, you may also be looking for ways to prevent them in the future. Like adults, migraines in children often have triggers that can cause or intensify how they are feeling. Preventing migraines in children isn’t an exact science, and you will need to determine what triggers can bring your child’s headaches on. Skipping the ice cream can help. One study found that almost all headache sufferers said that cold triggered their painful symptoms Thankfully, when caused by ice cream, migraine headache relief in children often occurs rapidly after the “brain freeze” is over. Besides ice cream, other foods can flare up pressure. Foods containing a lot of additives, nuts, artificial sweeteners, and even aged cheese have been shown to trigger migraine headaches in children and adults. One possible method of prevention is to notice which foods seem to be causing symptoms in your child and removing those items from his or her diet. You can also note where and when migraines are occurring. Is your child in pain after strenuous exercise? Is your child getting migraines when stressed? Look at what is happening before your child starts showing symptoms and try to reduce the frequency of things that are pain culprits. Often before a migraine, your child might go into premonitory phase or “predome”. This occurs right before the migraine as a sort of warning. During this phase, your child may be irritable, have a food craving or conversely, refuse to eat, have a hard time sleeping, be overly talkative or conversely, antisocial, or experience either noticeable joy or sadness. If your child is exhibiting the signs of predome, try to make them very calm and comfortable. Avoid hot or cold foods, use quiet voices and dim the lights. Try anything to make their surroundings as serene as possible. This might not prevent the oncoming migraine, but it might reduce the severity or discomfort that your child feels. Once your child has a migraine, you will be looking for ways to treat it. Your child’s doctor or pediatrician will talk to you about treatment options, but there are home remedies for migraine headaches that will help ease your child’s discomfort. Having them drink water or using a cold or hot compress depending on their preference may help ease their symptoms and reduce recovery time.